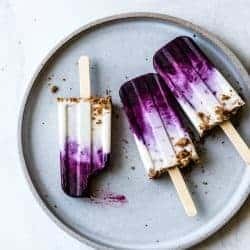 When you need cheesecake but it’s too hot to bake, these creamy chèvre cheesecake popsicles marbled with fresh blueberry compote and topped with graham cracker crumbles satisfy on the warmest of days. Thanks to Vermont Creamery for sponsoring this post! After each meal, a cart laden with local delicacies would be wheeled to the table. The regional specialty was aged goat cheese the likes of which I’d never before tasted. They came in different shapes and sizes, each geometric beauty boasting a center of crumbly chèvre, an aged outer rind sometimes rolled in ash to give it a blue-gray hue, and in the middle of the two, a gooey layer similar to baked brie. I was smitten. Back in the US I looked in vain for something similar, eventually giving up and making do with cheddars, bries, and goudas (did I mention I really like cheese?) It wasn’t until a friend brought a Vermont Creamery Bonne Bouche home from the fancy food show a few years ago that I discovered my cheese soul mate. It should have been no surprise that the co-founder of Vermont Creamery, Allison Hooper, also had a torrid love affair with the cheeses of France. 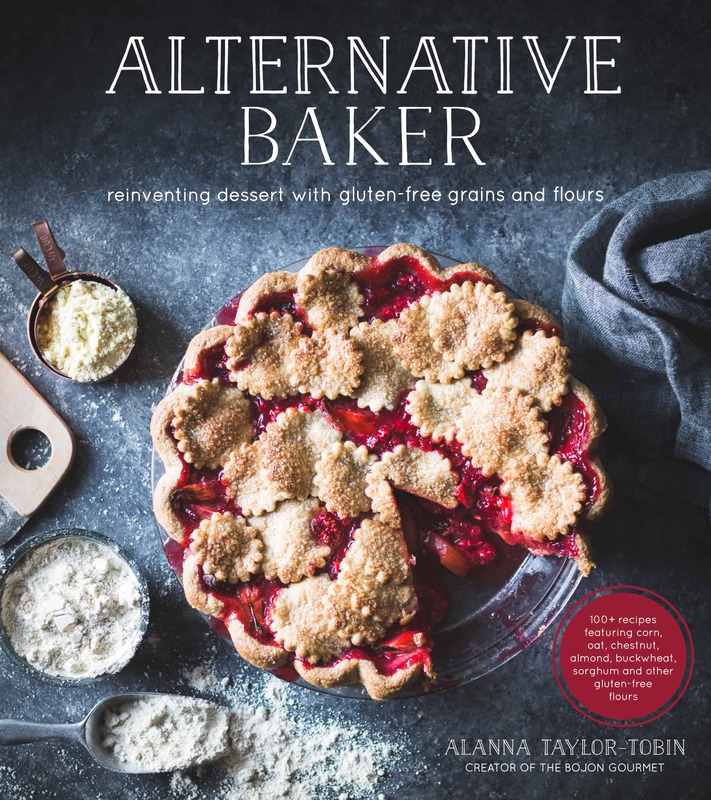 She modeled hers after those traditional gems when she founded the creamery in the mid-80’s. 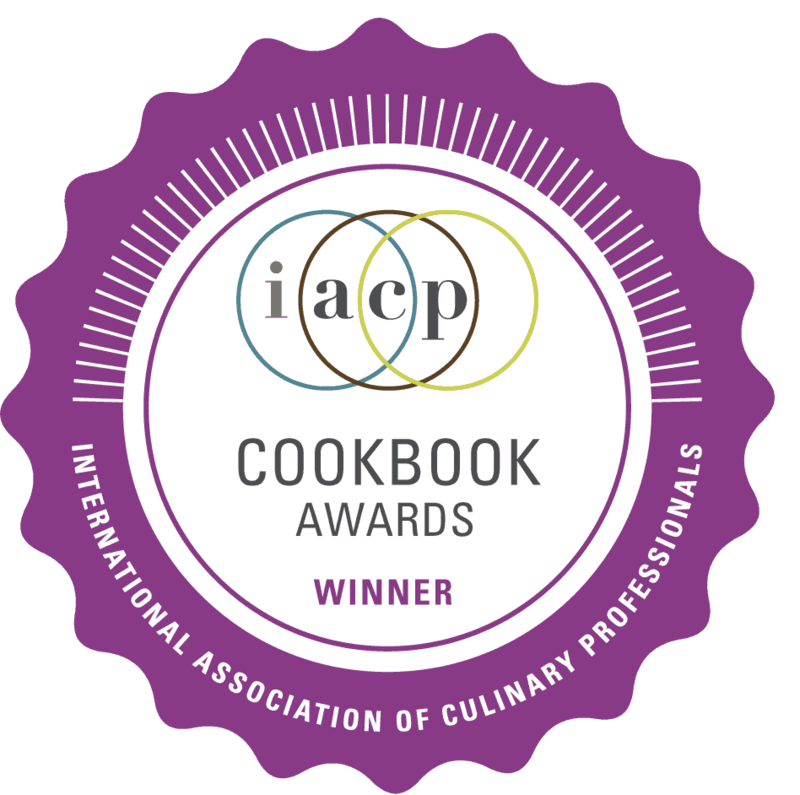 Since then, Vermont Creamery has accrued over 100 awards for their dairy, and when you taste it, you’ll know why. Their butter is cultured, European-style, full of rich flavor and boasting a golden hue. Their crème fraiche is thick enough to stand a spoon up in; the vanilla bean version is worthy of eating straight from the carton. And their aged cheeses – Cremant, Coupole, Bijou, and St. Albans – rival my taste memory of that summer in France. No small feat. In addition to aged cheeses, Vermont Creamery sells award-winning fresh goat cheese that boasts a clean, bright flavor and creamy-crumbly texture. I’ve used their classic chèvre in mac and cheese, pizza, pasta, and salads, and I also love it in sweet applications. 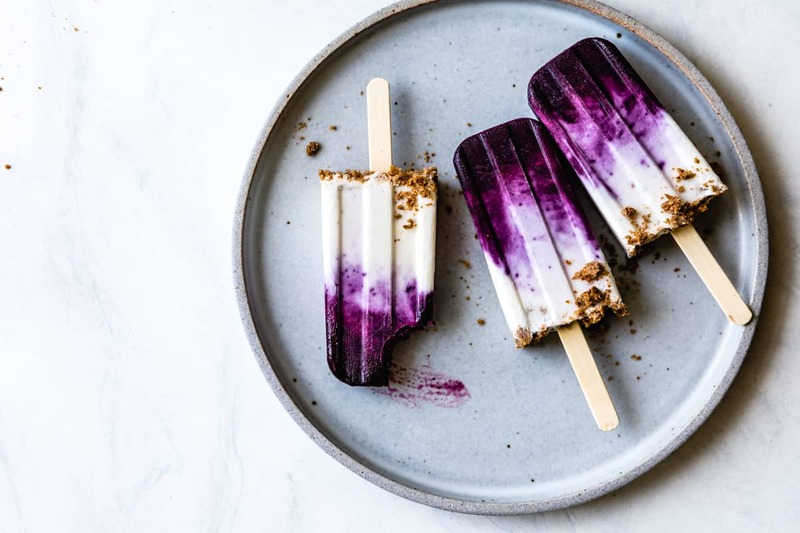 Vermont Creamery recently released versions flavored with smoky pepper jelly, clover blossom honey, and blueberry lemon & thyme, the latter of which inspired these popsicles. 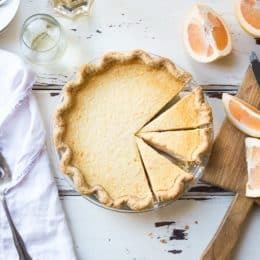 Adding chèvre to cheesecake plays up the savory-sweet notes inherent in the dessert, and this frozen version keeps your kitchen and yourself cool on a hot day. 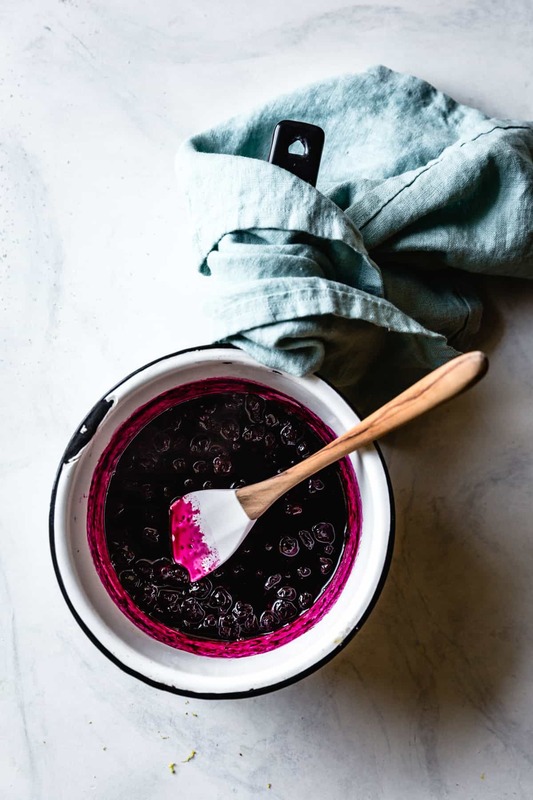 Blueberries simmered with a bit of sugar and lemon and pureed into a simple compote offset a creamy base of chèvre, cream cheese, and milk flavored with lemon and vanilla. Swirl those together and top the pops with crumbled graham crackers (the recipe for the homemade GF grahams shown here is coming soon!) 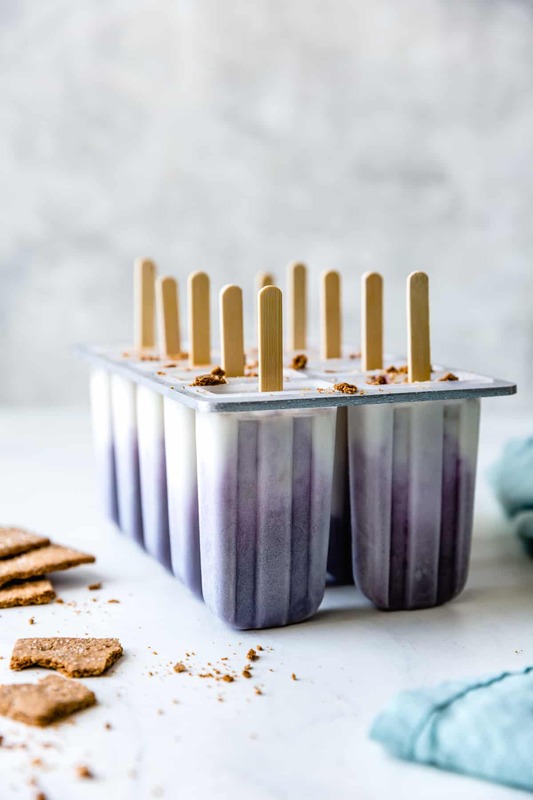 The grahams soften in the freezer but maintain their toasty sweet flavor, making the pop taste like the most sophisticated cheesecake, frozen. Last fall I had the pleasure of attending Cheese Camp – three blissful days spent with some of my favorite foodie friends (Sarah M, Sarah F, Michelle, Lily, Amanda, Judy, and Carey) exploring Vermont, enjoying local sips and bites, and (naturally!) gorging ourselves on cheese. 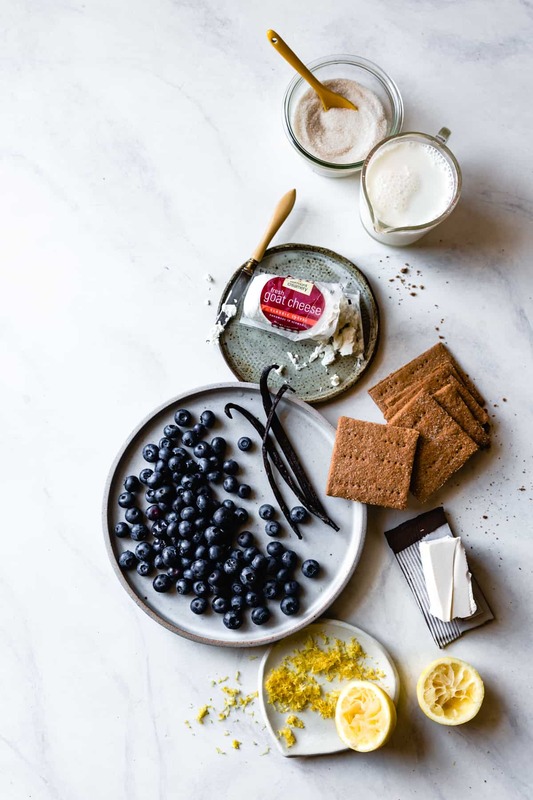 In addition to making delicious dairy, Vermont Creamery has been a certified B Corp since 2014 and continually develops new ways of supporting their employees, community, and the environment as best they can. They source their cow and goat dairy from small, local farms where the goats and cows are given plenty of space, fresh air, and good stuff to eat. The freshness of the milk translates into cheeses that boast clean, bright flavor, and by buying local, Vermont Creamery strengthens their community and saves on fossil fuels. A sustainability committee monitors water and energy usage, developing new ways of conserving both. 50% of the management roles in the company are filled by women, and employees are paid to volunteer at local organizations during work hours if they wish. Do you love chèvre forevre? Let me know your favorite ways to use it in the comments below! 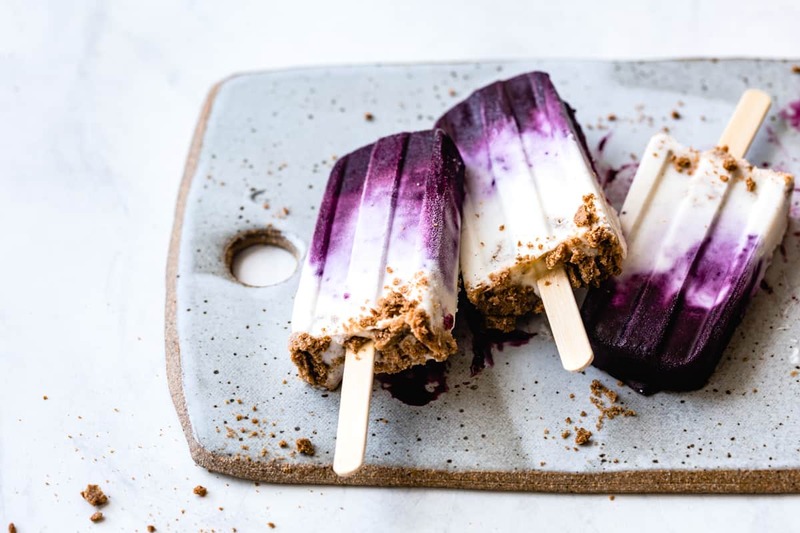 And do yourself a favor – pick up some Vermont Creamery goodness at a store near you and make a batch of these blueberry chèvre cheesecake popsicles while fresh blueberries are in season. You won’t be sorry. 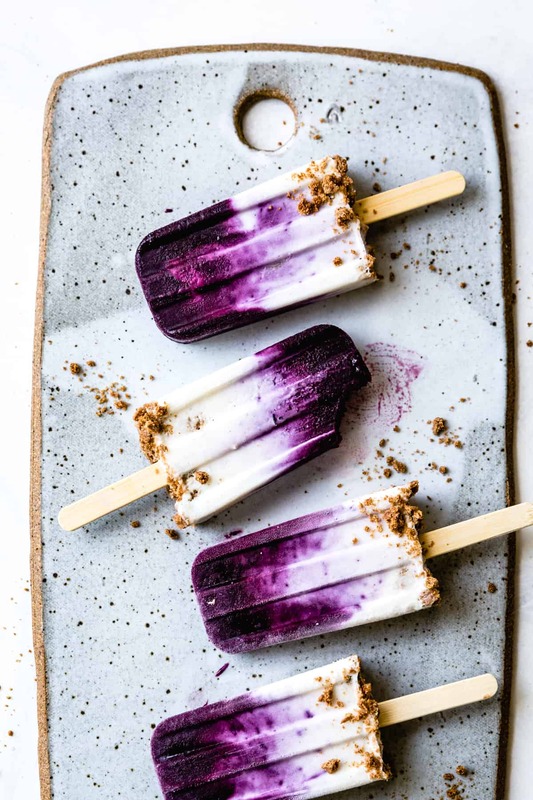 Bright berries, a hint of lemon and vanilla, creamy fresh goat cheese, and a crumble of graham crackers make these popsicles little addicting treats on a warm day. Feel free to swap the blueberries for any fresh summer berry you like. 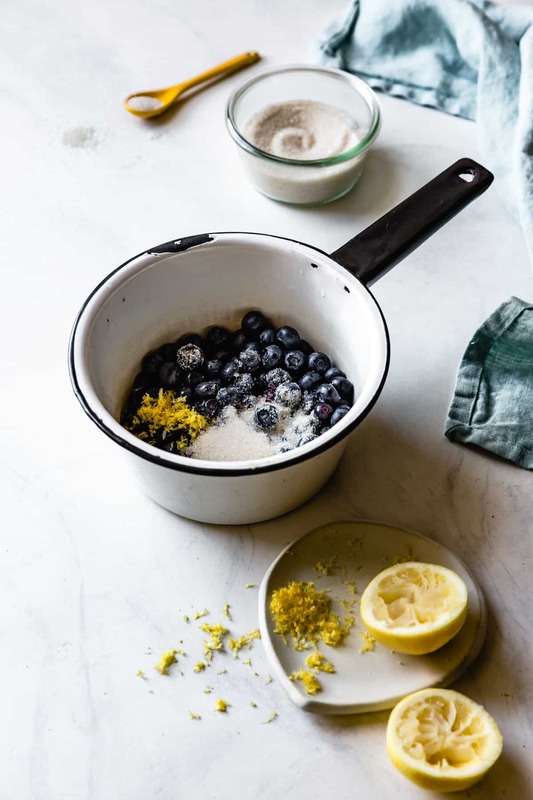 Combine the blueberries, lemon zest, lemon juice, sugar, and water in a medium saucepan. 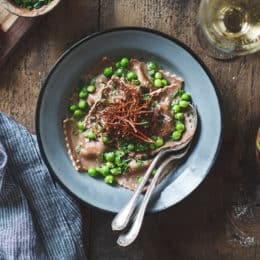 Bring the mixture to a simmer over medium heat and cook, stirring occasionally, until the juices are reduced by half and bubbling thickly, 5–10 more minutes. Let cool to room temperature, then puree smooth. You should have about 1 scant cup. 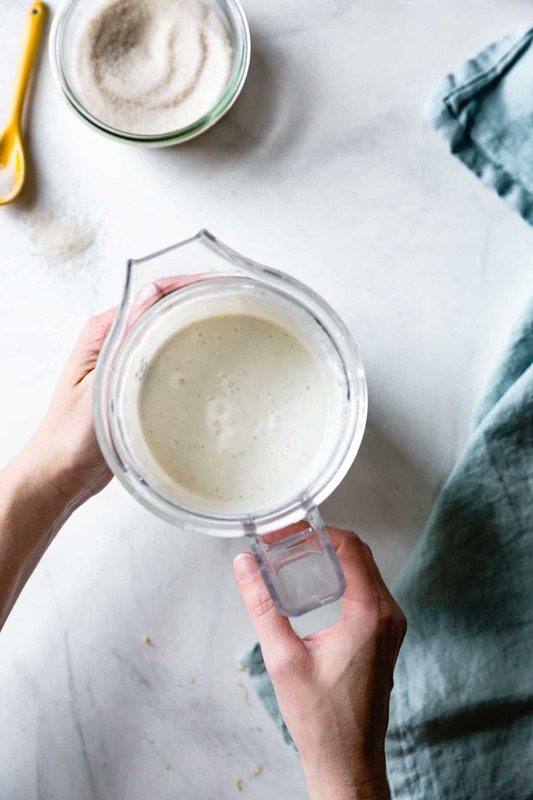 In the pitcher of a blender, combine the goat cheese, cream cheese, milk, vanilla, lemon zest and juice, and sugar and puree smooth. 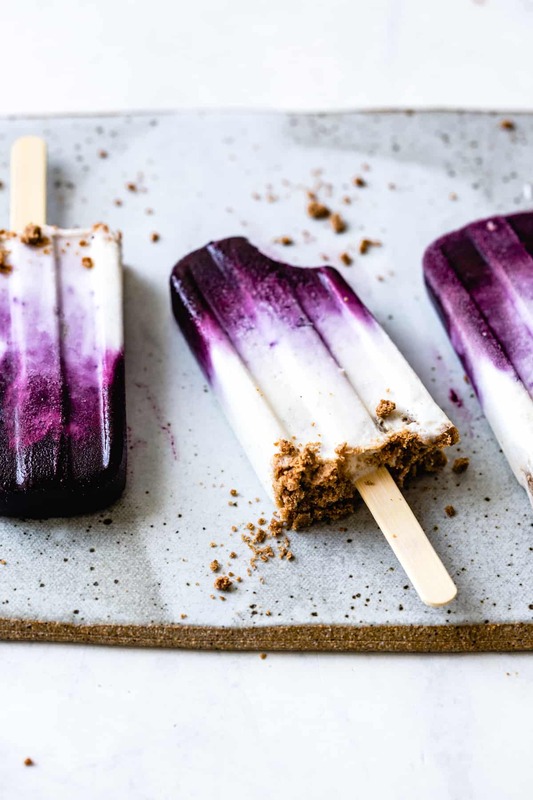 Divide the blueberry puree among 10 (3-ounce) popsicle molds. Gently pour the cheesecake layer over the blueberry layer, leaving a scant half-inch of space at the top. Use a chopstick to swirl the layers together slightly. Crumble the graham crackers on top of the cheesecake layer and press the crumbles into the mixture so they stay put when frozen. Place popsicles sticks in the molds and freeze until solid, several hours or overnight. Remove from the molds and serve, or store airtight for up to a week or two. 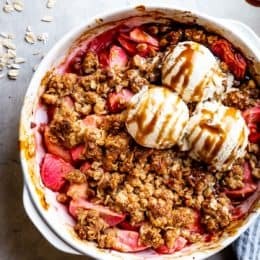 Imma make these babies with peaches because that’s what I have and I don’t want to delay another minute. ALANNA! These photos are s.l.a.y.i.n.g me. 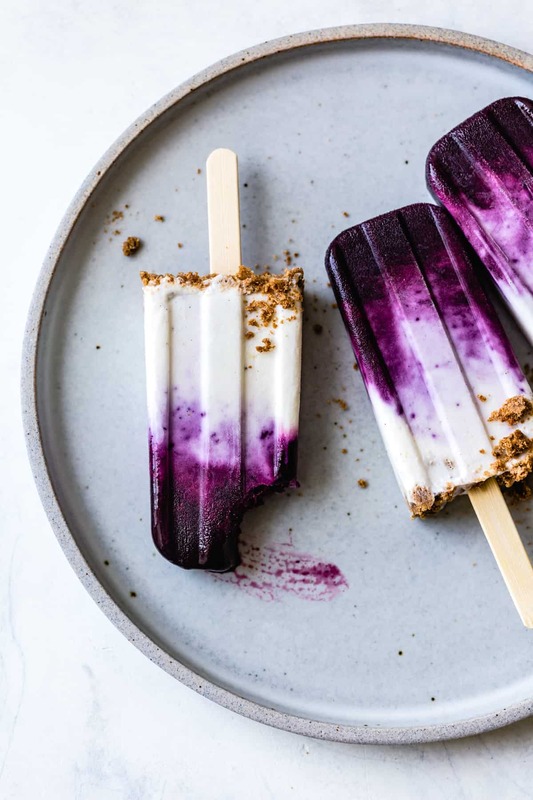 I think these are the prettiest popsicles I have ever seen! And I know this is totally random…but where is your spatula from? It is beautiful! This sounds like MY kind of popsicle! I do love chèvre forevre, times 1000! And, that’s so cool Vermont Creamery is a B Corp! I’m obsessed with B Corps and have always wanted to start one…so I love supporting them! Yes, I’m so inspired to learn more about B corps too! Finally a way to measure the success of a company in a way other than monetary growth. such a sophisticated popsicle! 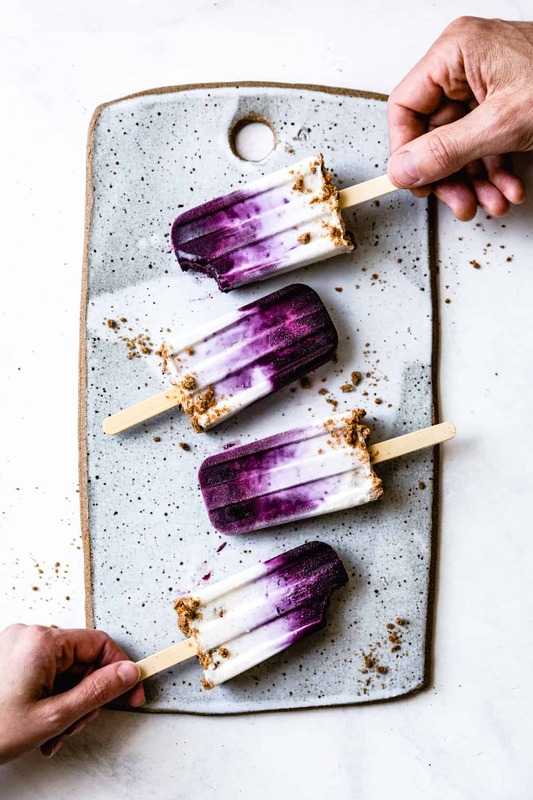 Fun to make too, don’t think I’ve seen a more gourmet popsicle before, thank you for this wonderful recipe! 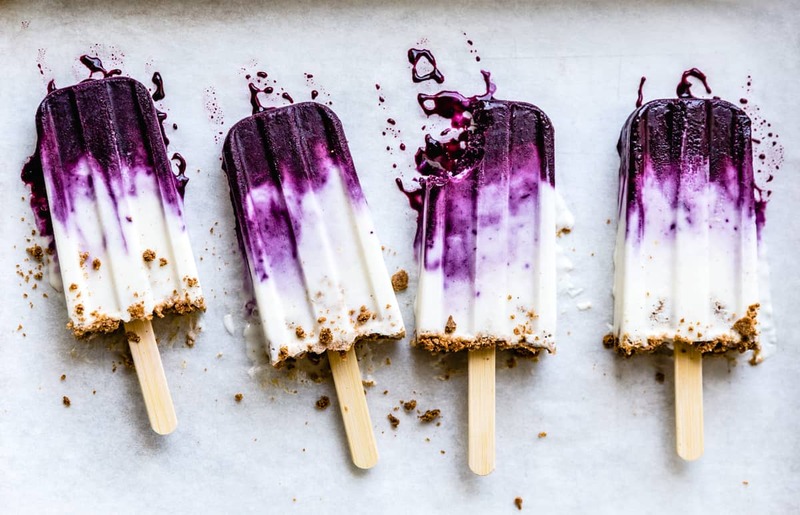 Wow, blueberry chevre cheesecake popsicles. I just love this. You made my day. Many many thanks for sharing with us. YESSS! My kids will LOVE these! Plus blueberries are good for your brain/memory, so kudos on that! 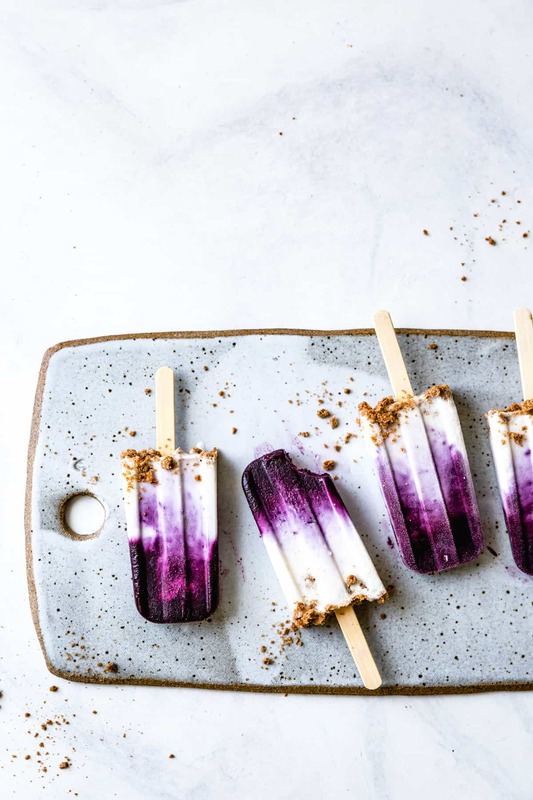 So gorgeous – would you call them ombre popsicles?? 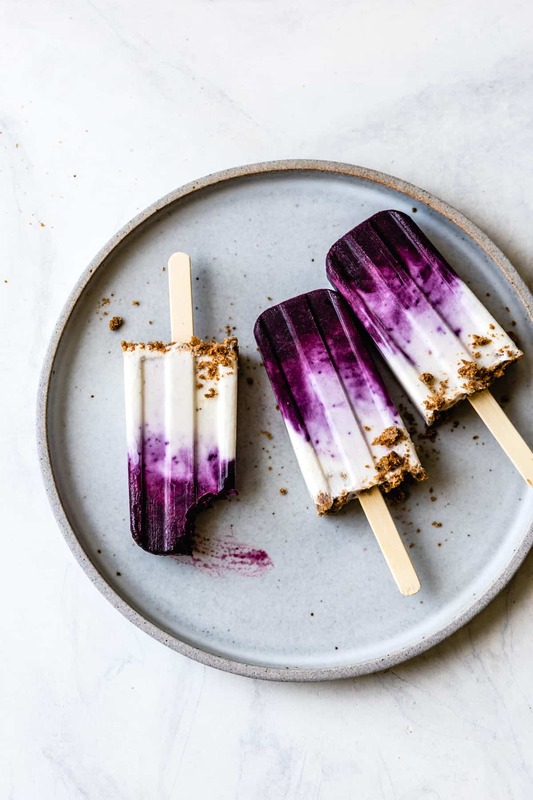 Have actually never made my own popsicles – must finally give it a go this summer. Love that you used goats cheese too! 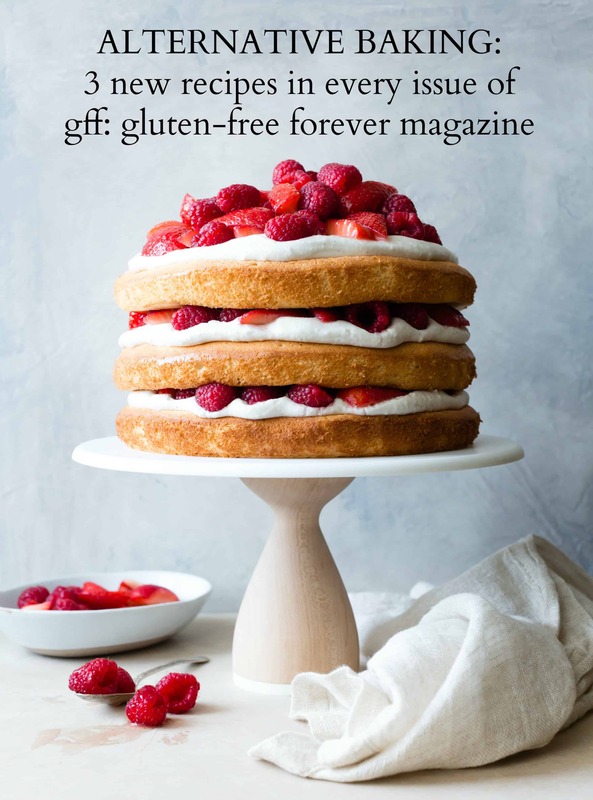 Love chèvre – probably my go to way is whisked into scrambled eggs for extra creaminess or on top of salads – favourite being a roast pear & beetroot.